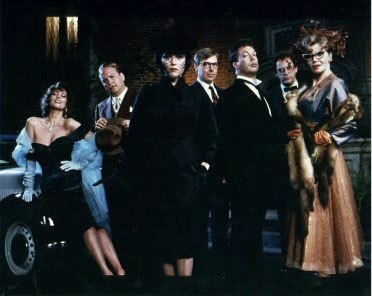 Jonathan Lynn's 1985 film, Clue: The Movie, based on the Parker Bros. board game, has one of the best ensemble casts ever put together. It's also one of the best mysteries ever written. And who’s behind the story? John Landis* and Jonathan Lynn; both have had their share of hits in the 80’s and 90’s but Landis was on one of the best hot streaks in the 80's, and this is no exception. 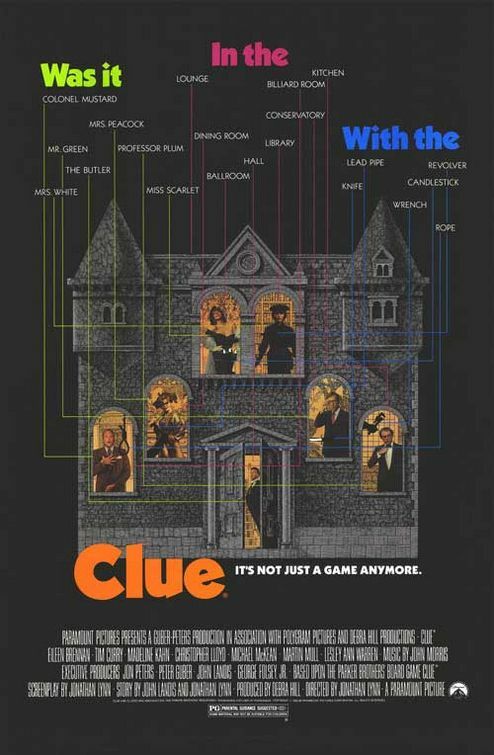 Clue: The Movie finds six guests invited to a mysterious dinner in a frightful mansion. All six have been invited under questionable circumstances and little by little they discover their host’s true intentions. Once revealed, the murders begin and making it alive through the night becomes everyone’s number one goal…or so it would seem. The dialogue is whip-smart and the performances are impeccable. Most of it feels highly improvised and I wouldn’t doubt it considering the caliber of talent. Young as they were, Michael McKeon (Spinal Tap), Christopher Lloyd (Back To The Future) and Madeline Kahn (Blazing Saddles) were in full bloom and laying down a foundation for a career of even more incredible future performances. And it would be a shame not to mention Tim Curry, Martin Mull and Eileen Brennan who never seem to get the attention they rightly deserve. It’s a film packed full of great lines and if there isn’t already a yearly screening of this film at your local art house theatre, there really should be. So spread the word, Readers. This is one of those movies that should be in every household and shown to every generation. And since at its core it’s really a mystery, this might be great for a Halloween treat. Fun for the whole family - just like the board game! TRIVIA: The first movie based on a board game.